The LakeShore & The LakeFront is a new residential condominium development currently in pre-construction located at 500 Lake Shore Boulevard West in Toronto, Ontario by Concord Adex. 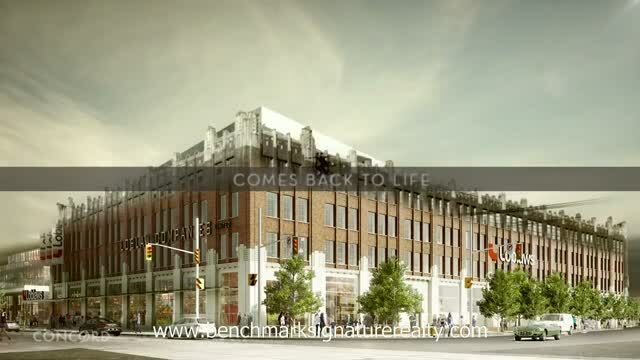 It is the second phase in the West Block redevelopment consisting of two towers of 40 and 44 storeys in height with the first phase being a 7 storey commercial/retail building with office space anchored by Loblaws Great food store at the corner of Lake Shore Boulevard West and Bathurst Street. Scheduled completion date for the West Block is Spring 2019. The LakeShore & The LakeFront Condominiums is "the most anticipated waterfront condo by Concord Adex". They consist of two slim residential towers of 40 and 44 storeys in height connected at the base into the refurbished 1928 Loblaw building that anchors West Block. This 7 storey building has 50,000 square foot of the Loblaws flagship supermarket, offices, 87,000 square feet of retail and an 11,000 square feet restaurant. The two towers are situated at the rear of the site. The LakeShore which is Tower A and is the west building with a proposed 40 storeys (120 metres in height) and The LakeFront Tower B is the east building with a proposed 44 storeys (130 metres in height). There are 851 total proposed dwelling units with a total residential gross floor area of 54,460 square metres. A total of 605 parking spaces are proposed of which 264 are for residents, 26 are for visitors, 308 are for retail and grocery and 7 are for car sharing spaces. There is also 983 bicycle spaces proposed of which 724 are for residents. This is a revised proposal since the previous one was for an 8 storey commercial building and two towers of 37 and 41 storeys with 840 units. The LakeShore & The LakeFront Condos in Toronto Waterfront will be "one-of-a-kind" with "exceptional lake and city views" and easy access by foot or public transit to Harbourfront, Lake Ontario, shopping, dining, entertainment and cultural venues. There will be a common space under the Gardiner Expressway that will showcase the "culture and vibrancy of Toronto through a display of public art". The LakeShore & The LakeFront Condos will have iconic architecture from architectsAlliance with premium finishes. Most of the suites will have open balconies or terraces and includes a Bosch appliance package with integrated panel for both the refrigerator and dishwasher, Bosch hood fan, Bosch electric cook top, Bosch wall oven and Panasonic microwave. Two bedroom suites and up will receive a 30" integrated fridge upgrade. Residential Tower A which is the west building will have proposed retail and commercial use space with amenity space located on the third, fourth, fifth and fortieth floor. Residential Tower B which is the east building will have proposed amenity space located on the third, fourth, fifth and forty-fourth floor. There is approximately 1,278 square metre of indoor amenity space proposed and 851 square metres of outdoor amenity space proposed. Amenities include 24-hour concierge, guest suites, weight room, fitness room, dance and yoga studio, spinning room, swim spa, spa zone, sauna, men's and women's change rooms, kids play room, outdoor lounge, private party room, billiards table, theatre, study area and wifi lounge, BBQ area, meeting/cards room, pet spa, study rooms, an outdoor playground with mini golf and finally, roof garden and tea rooms locatedin the east tower. Live at The LakeShore & The LakeFront Condominiums in downtown Toronto with stunning lake views near the Fashion District and the Entertainment District. Live near the water. Live here. A 50,000 sq. ft. Loblaws flagship supermarket, 11,000 sq. ft. restaurant, and 88,000 sq. ft. of additional retail. Refined suite design. Inspired features and finishes and a compendium of life, health, and fitness amenities like none other. Concord Adex is a subsidiary of Concord Pacific. In 1997 Concord Pacific acquired prime waterfront real estate in downtown Toronto. It was at this time Concord Adex was formed to oversee the development of this inaugural Concord CityPlace site. In 2006, Concord Adex further acquired real estate, which would become the new home to Concord Park Place in the City of North York. 509 Harbourfront, running eastbound to Union Station and westbound to the Ex. 511 Bathurst, running northbound to Bathurst Station and southbound to the Ex. 145 Downtown / Humber Bay Express, running eastbound to Jarvis & Richmond and westbound to Kipling & Lake Shore. This is an express bus that costs double fare and only operates a couple times in the morning and afternoon rush. To get from The Lakeshore Condo straight to Bay & Adelaide is about 15 minutes, whereas taking the streetcar to Union and walking to Adelaide might be closer to 25 minutes. This runs every half hour from 5:30 AM to 6:30 AM. 310 Bathurst Night, running northbound to Steeles and southbound to the Ex. This runs every half hour from 2 AM to 5 AM. A walk over to Spadina gets you to the 510 Spadina (to Spadina Station or Union Station) streetcar.